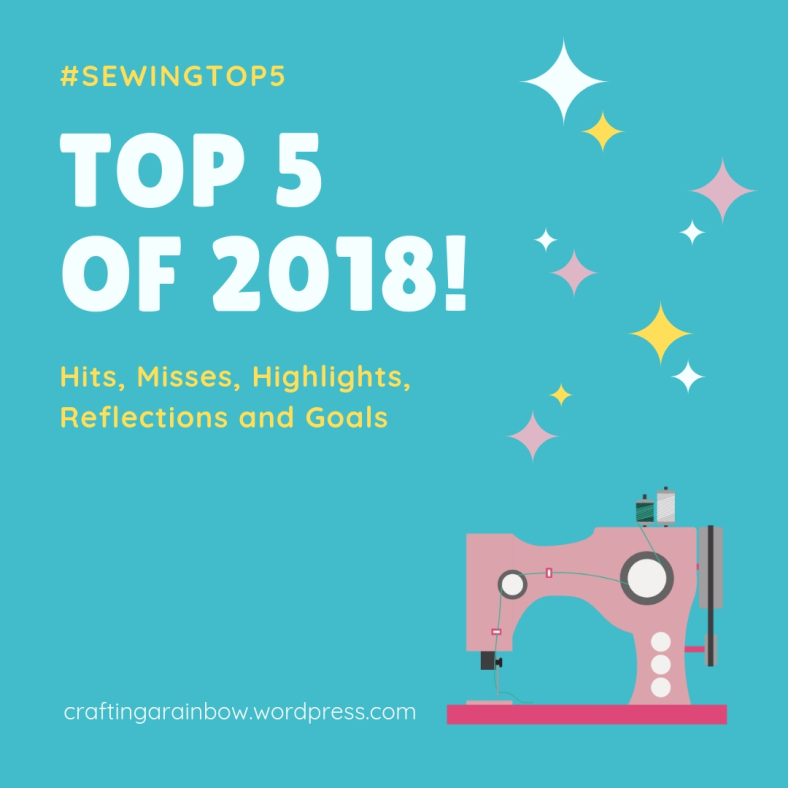 I’ve wanted to take part in one of the many many Instagram sewing challenges that keep popping up, but don’t seem to be able to find one that works with my current sewing plans. Then when the #sewOver50 organizers announced the #so50Visible challenge, I decided to make more of an effort to participate. The challenge is aimed at raising awareness and calling for pattern makers to include older models on pattern covers and in other marketing for their patterns. To participate, you post a make of a pattern that features an older model in the marketing. I started watching the #so50Visible tag on Instgram and browsing the list that Sue Young put together of pattern companies that use older models. My criteria was to find something that was cold weather appropriate so I could wear it now, not require too much fitting, and use fabric I already had. Eventually I found the Presto Popover Top by Naughty Bobbin Patterns. It’s a knit top — so easy to fit. It’s got a collar to keep my neck warm, which I like, and long sleeves. And there are quite a few positive reviews on Pattern Review. But I didn’t have any appropriate fabric. Fortunately I was about to place an order at Gorgeous Fabrics and she had a knit pattern that I thought would work. 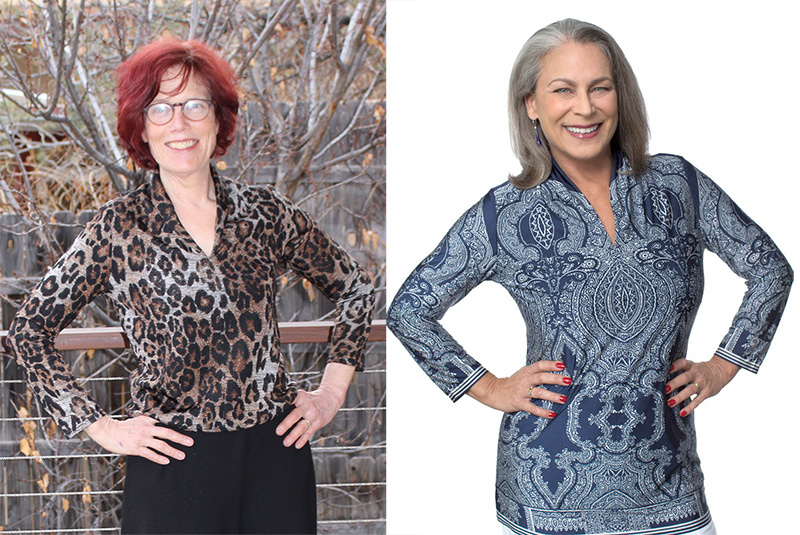 And here I am, on the left, modelling my new shirt and attempting to pose like Coco Savage, the pattern designer, on the right. 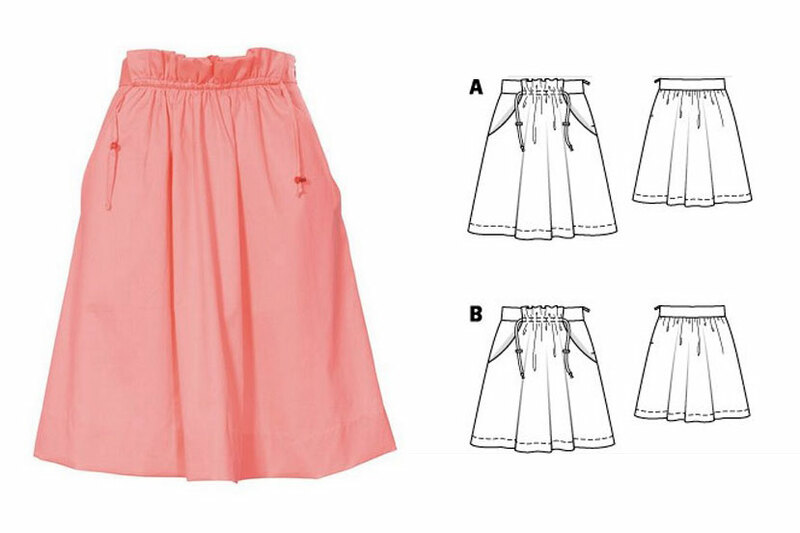 About the pattern: It’s got a clever construction where you cut 2 fronts, sew them together vertically along center front, then connect this to the back using the “burrito method” to get a completely enclosed neckline. 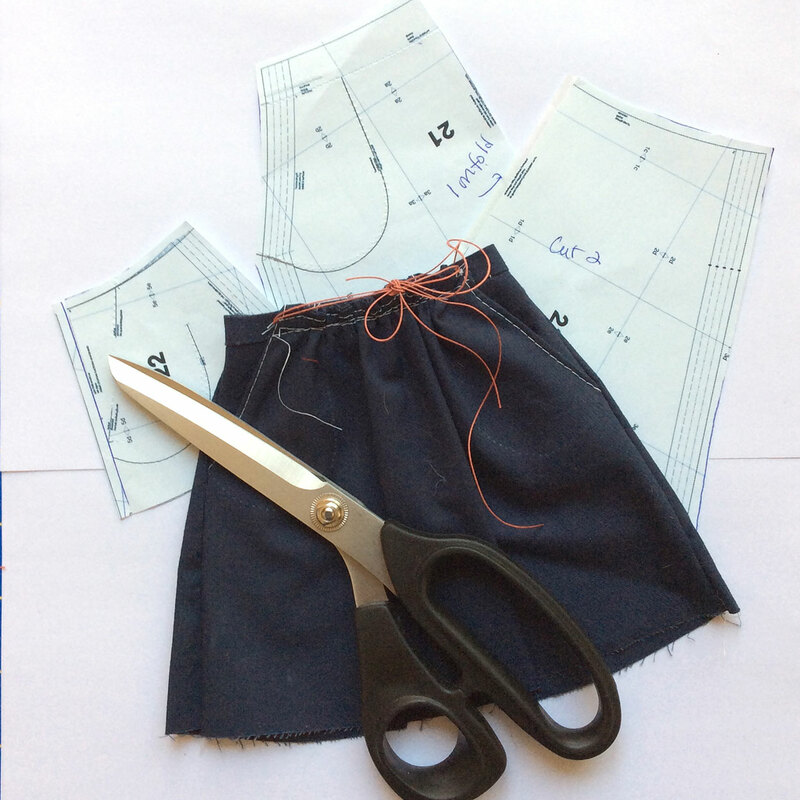 The instructions are quite minimal and there are no diagrams or pictures — so I did what I do with Burda patterns and made a doll-sized version of the pattern using scrap fabric to work out the construction. To make the doll-sized pattern, I enlarge the pattern drawings in the layout page of the PDF, cut out the fabric, and use a 1/4″ seam allowance when I sew it together. 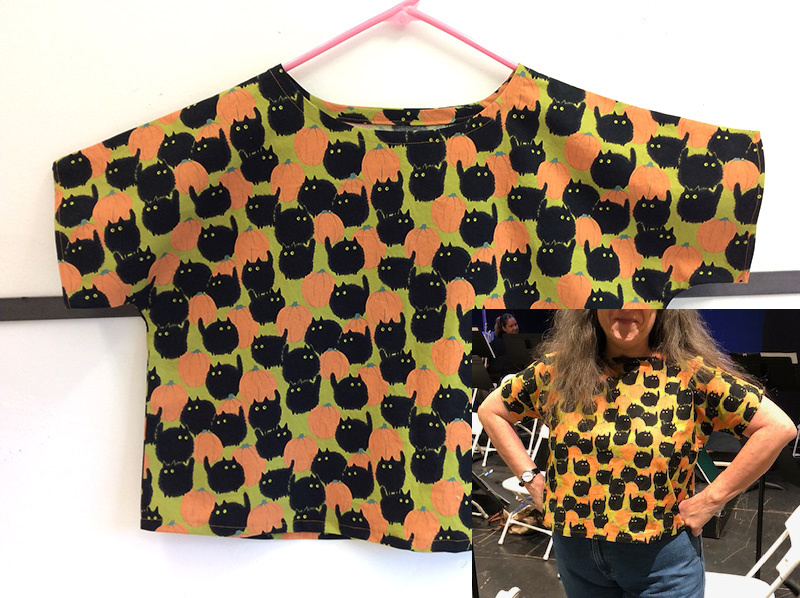 I made a size medium, after comparing the pattern pieces to pattern pieces of a t-shirt I’d made previously. And I made 2 alterations: lengthened the sleeves by 4″ to get bracelet length, and shortened the body by 4″ as I wear shirts untucked and most of my pants and skirts are high-waisted (I’m 5’3″). For next time, I would raise the v-neck a bit (there are 2 options for the v on the pattern, and I made the higher one). 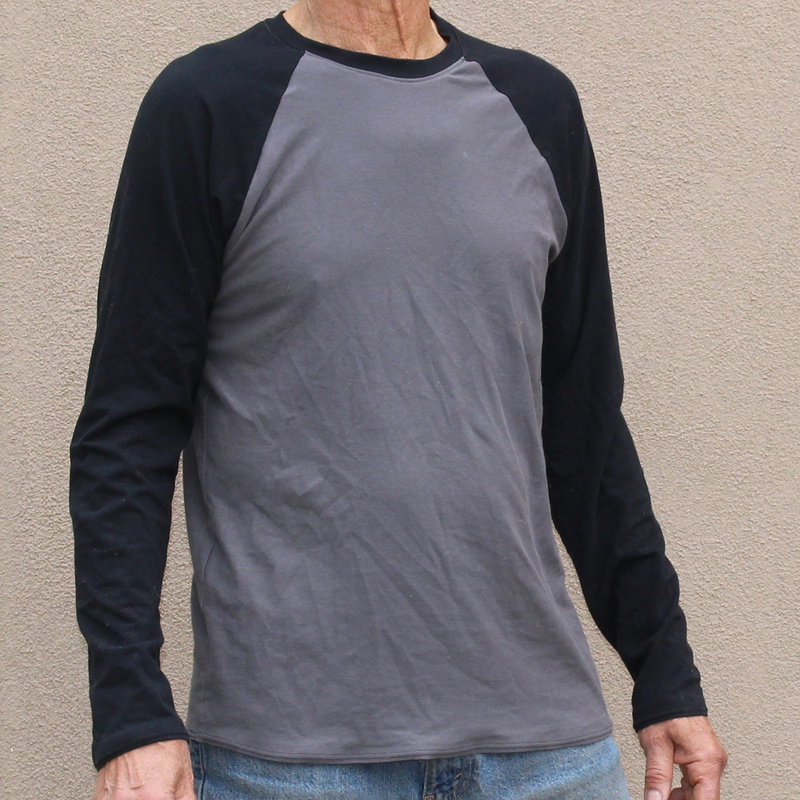 Because the top requires 2 fronts, it uses more fabric then a conventional t-shirt. And I had to do a bit of pattern matching along center front where the 2 fronts meet. I’ve worn the top 3 or 4 times already, so it’s definitely a keeper. And I’ve been keeping my eye out for fabric to make a second one. As fall approached in my first full year of garment sewing, I began to feel as if the things I was making weren’t working well together, and a bit more planning was called for. 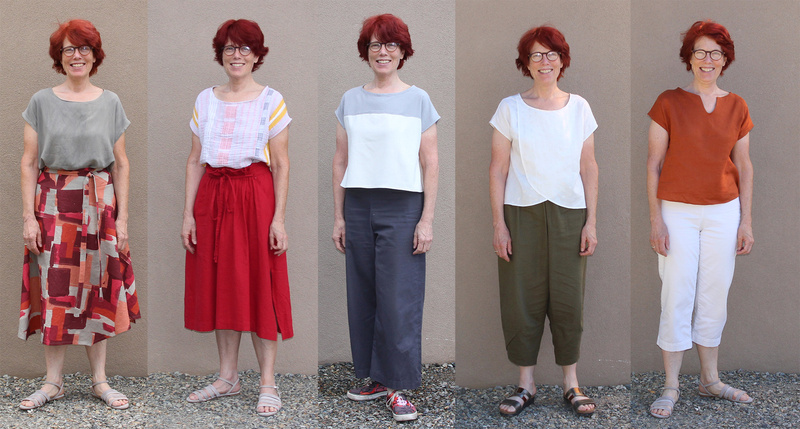 Then I read Sew Altered Style‘s blog post about her Seasonal Sew 3 challenge. The challenge: “Each season, choose 3 patterns that you want to make that season and then commit to making them over a 3-month period.” The example she gives is a small capsule set — pants, shirt, topper. I had just finished making a pajama set — top, pants, kimono/robe — and was really jazzed about how they coordinated, so I decided to try another set. This time it would be a skirt, cardigan and collared blouse. 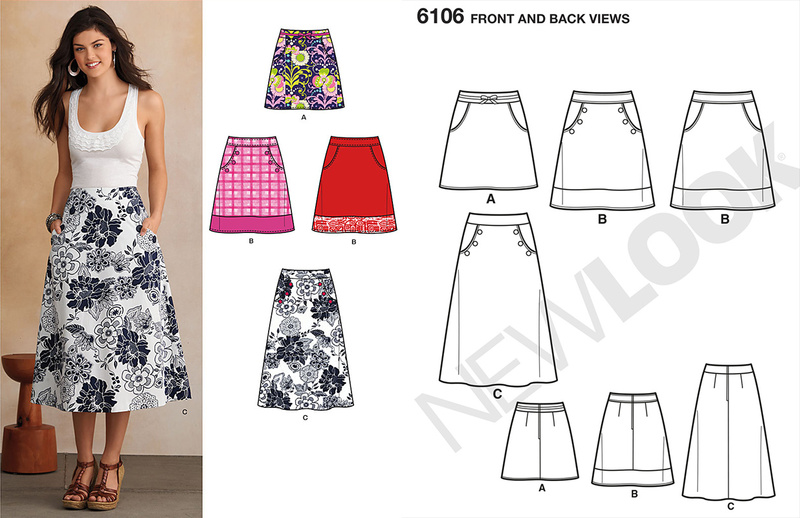 I started with New Look 6106, a simple a-line skirt with a curved waist-band, that I bought when I first started sewing, but hadn’t made yet. I started with View A, without the ribbon at the waist. After sewing it up, the ease in the hips and width at the bottom was way too much, so I took 6 inches off the circumference at the bottom, tapering to nothing at the bottom of the pocket opening. And I was pleasantly surprised that it went with several things I already had in my closet. And with 52″ fabric, it only uses a yard if you make the facing and pocket lining out of scraps. 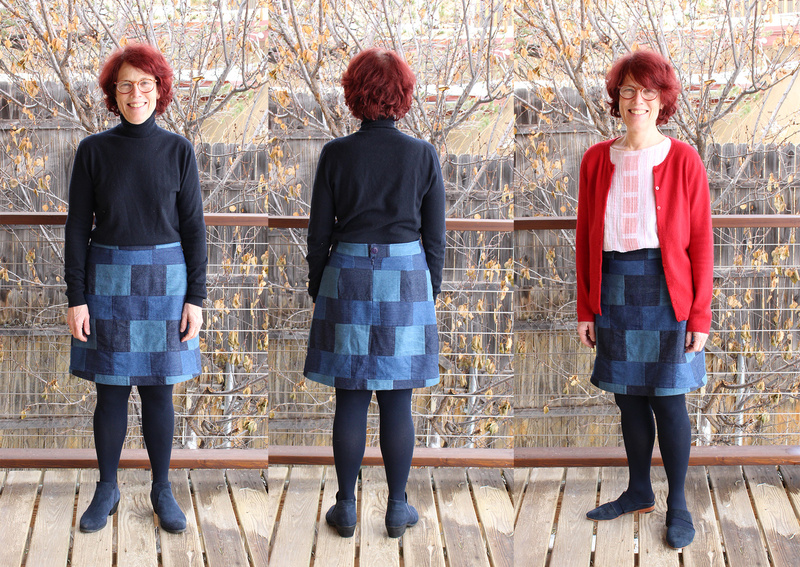 Next up I made the skirt for my seasonal sew 3 — from a wool blend from Style Maker Fabric. This time I drafted a lining, so it wouldn’t, like the sweet potato version, stick to my tights. The lining is a static-free one I got at Joann. 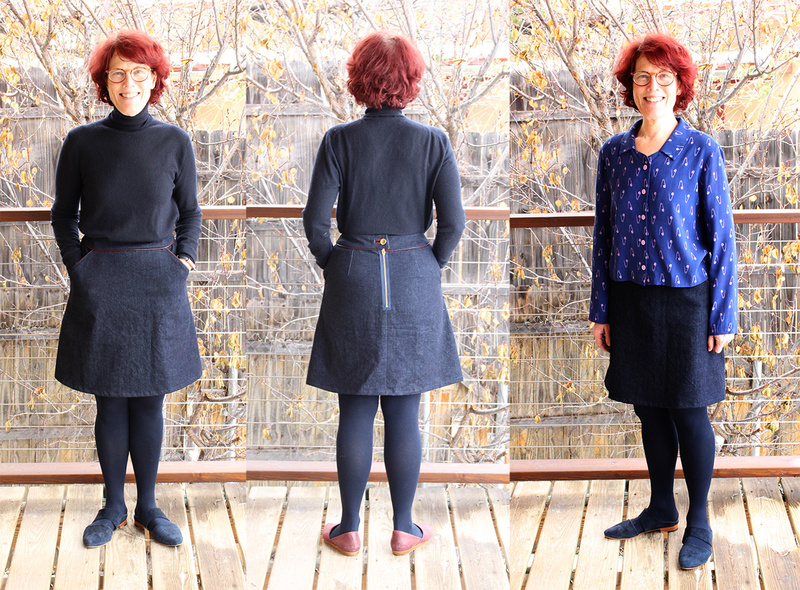 Below on the right is my seasonal sew 3 outfit — skirt, blackwood cardigan in a sweater knit from Marcy Tilton and another s2215 made from mora slub linen from Stone Mountain Fabric. 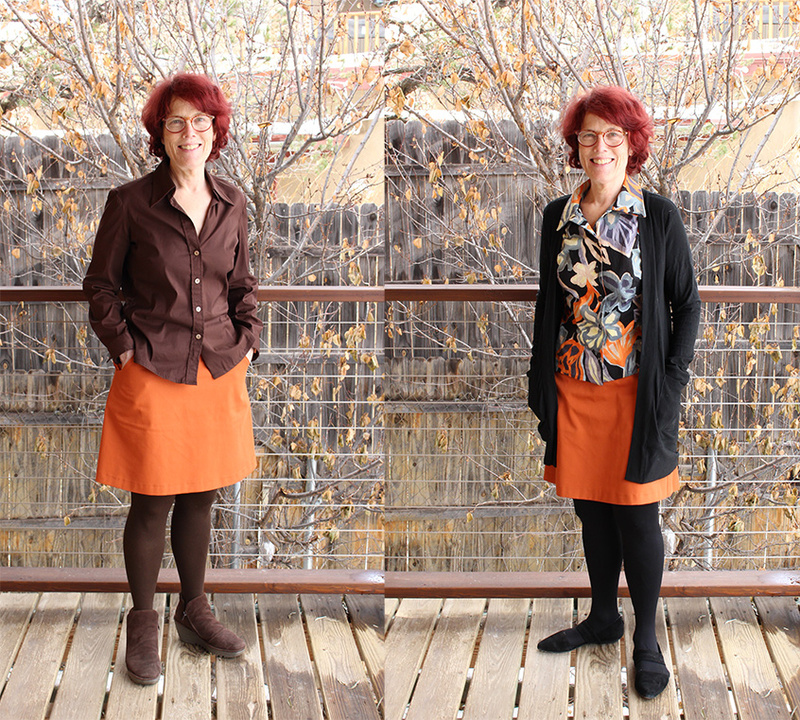 I was really happy with the rust color match between the blouse and sweater for my seasonal sew 3. Unfortunately, the sweater knit catches on everything and has gotten quite pilly. I’ve de-pilled it a few times since I made it in November, and I’m not sure it will last very long. making a welt buttonhole on the back waist band using the leatherette. 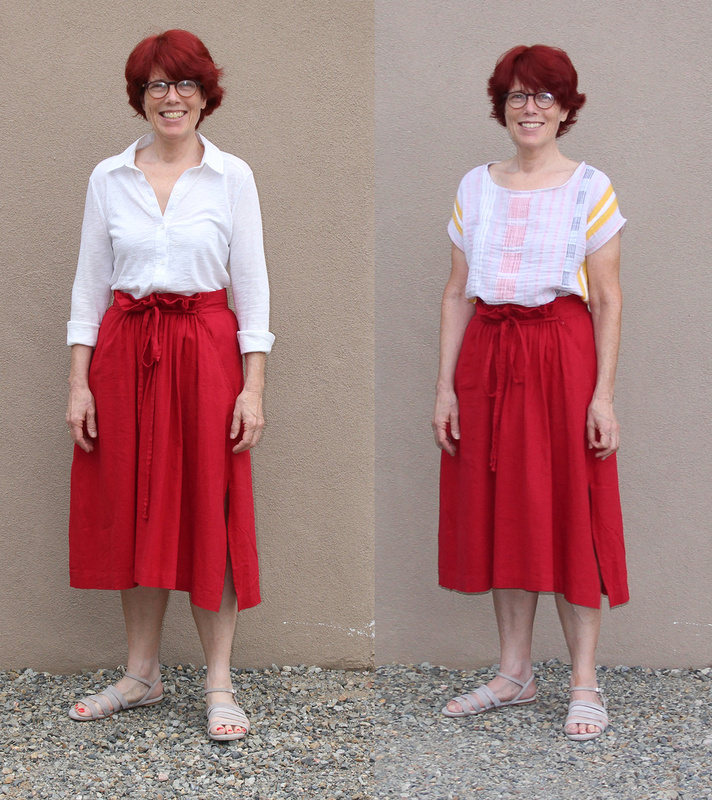 Left: dressed like a crayon, Middle: back with exposed zipper and welt button hole, Right: the top is a hacked Carolyn Pajamas top made from the nicest behaving rayon challis from Workroom Social. And last, the one I’ve worn the most, a couple of times a week. I saw this patchwork denim at Joann and couldn’t resist (plus I had a coupon). I see Style Maker Fabric has it too. This one doesn’t have pockets. 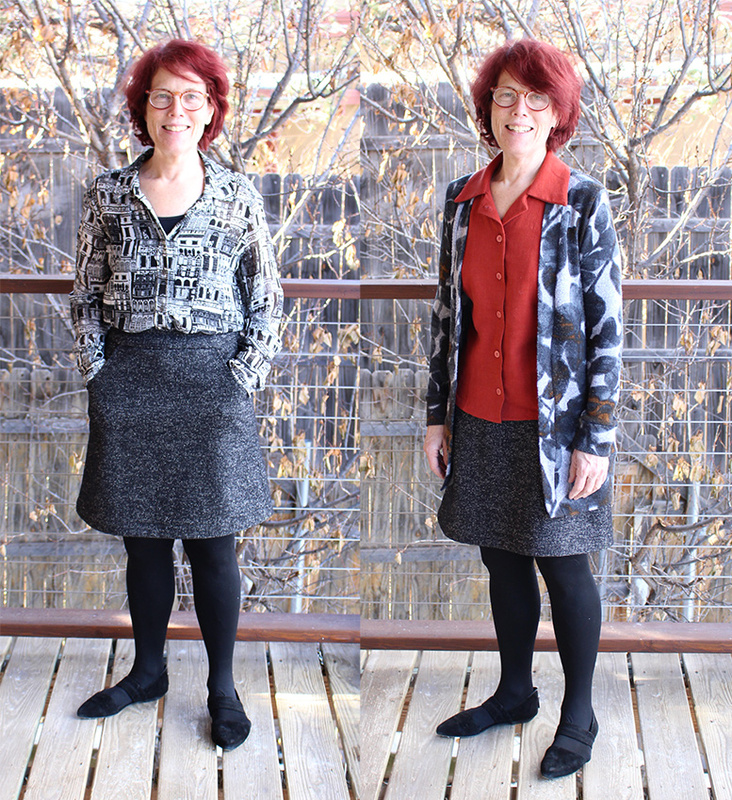 Left, dressed like a crayon again, Middle: I had fun planning the pattern-matching on the stripes created by the patchwork, Right: the top is a Maya top made from a dress that fell apart, and with a ready-to-wear cardi. One of my friends selects a word at the beginning of every year, rather than a resolution. 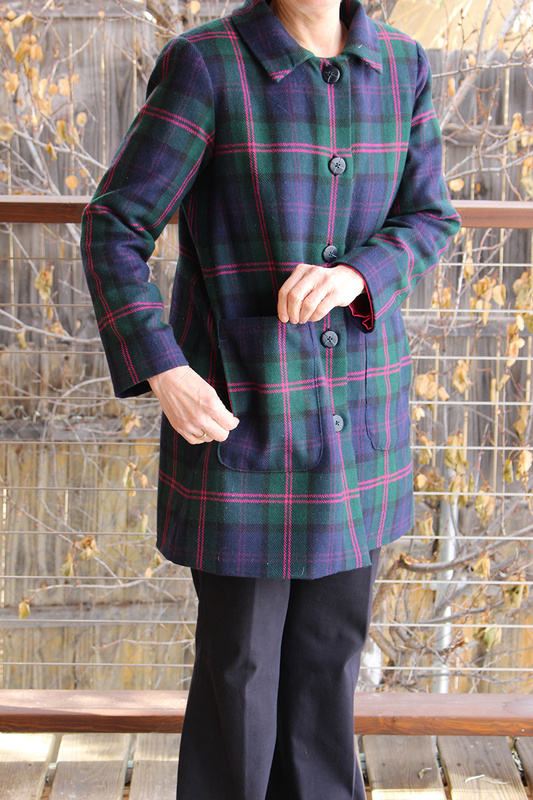 The idea is to apply that word to the things she does throughout the year — words like “play” or “ease.” At the beginning of 2018 I hadn’t been sewing very long, and picked “coat” as my word, hoping that in the coming months I would pick sewing projects that gave me the skills and confidence to make a winter coat. And I found the fabric (a wool coating) this fall, from Stone Mountain and Daughter. 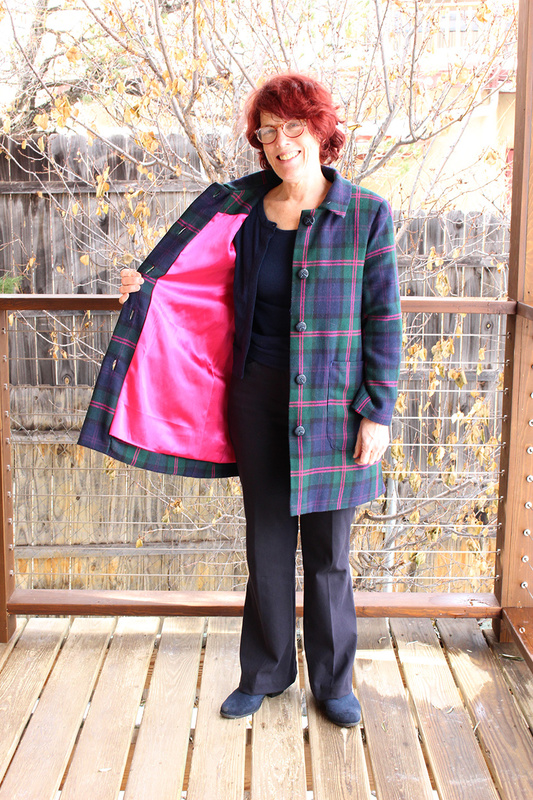 The Lisette coat has princess seams, and while there are lots of examples and blog posts about making the coat, I only found one sewist that made it in other than a solid color. 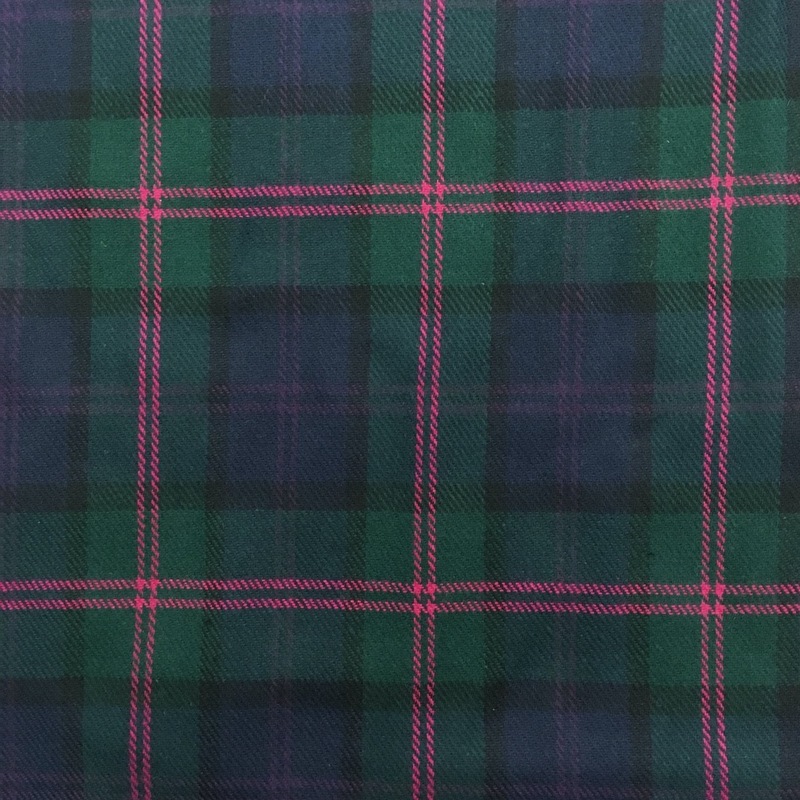 That made me nervous — plaid matching princess seams was maybe beyond my current skills. So I looked for another pattern. I found a couple of candidates, and bought the most promising. But I didn’t like the look after I made a muslin (the sleeves fit very oddly and I had no idea how to fix them). Same went for the second coat pattern (raglan sleeves, not what I wanted). But whoa did I learn a lot from making those muslins and what I was in for. They left me with a lot of questions too. Should I bag the lining? How wide should the hem be? When exactly during the coat construction do I make bound button holes — maybe before attaching the facing? So to boost my confidence a bit, I also watched several Craftsy classes about linings and tailoring. 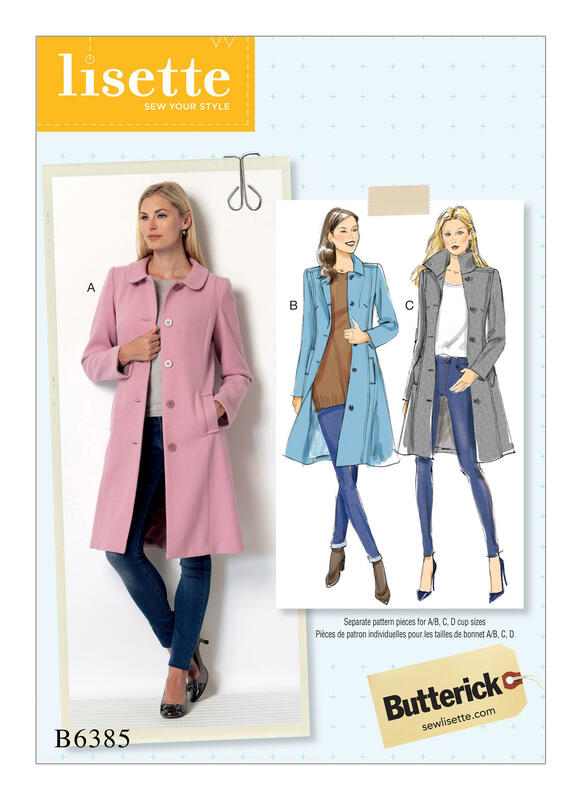 The third pattern I bought was McCalls 7481, to make view C. It’s described as “Lined vest and coat have front snap closing with sleeve and/or pocket variations. C: Collar and patch pockets.” My plan was to use buttons instead of snaps. Added length to make a 3″ hem, rather than a 5/8″ hem. It looked like the lining would show at the top when the coat was open, so I also drafted a back facing. The pattern had you just interface the collar and front facing. But after reading Lucinda Hamilton’s post here, I also used weft fusible for the bottom and sleeve hems, upper back and front, as well as the place where the pockets were to be placed. I got the interfacing from Vogue Fabrics. Okay, at this point I knew the pattern did me no favors, and I probably should have kept looking for something else. But it was mid-December by this point, and I blundered along, reasoning that this is my first me-made coat, and I had procrastinated enough. After I’d sewn the shell and tried it on, I realized I needed something at the shoulder. First I added a sleeve head using this Threads tutorial, but that didn’t make it look much better. Threads has a pattern for shoulder pads here and I had some quilt batting at home, so I tried making a set. I got to use the 3 step zigzag on my sewing machine — something I hadn’t used before! — but the resulting pads were pretty wimpy, so I ended up getting a pair at Joann. About my lining. I decided on Sunback lining (satin on one side, flannel on the other) because the wool I’d bought wasn’t really that thick. I got it at B&J Fabric. I’m glad I got a thicker lining, because the finished coat isn’t as warm as I’d hoped. 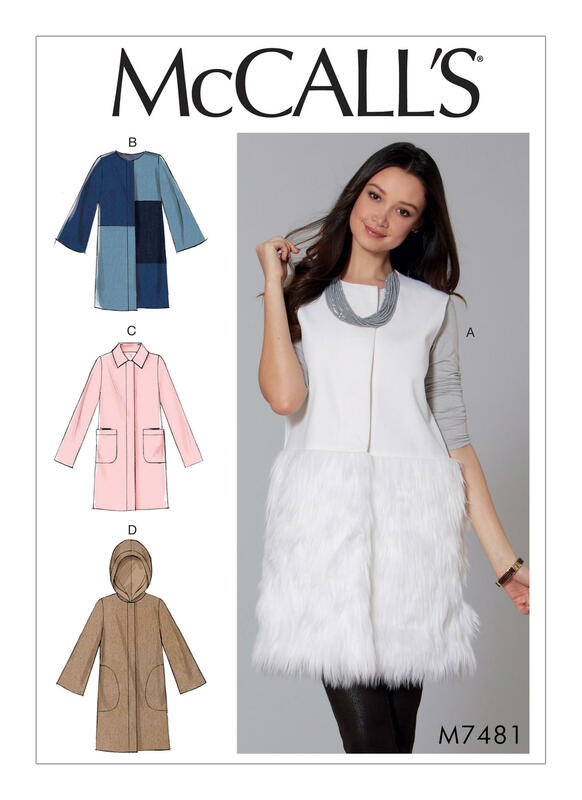 One of the coat patterns I’d considered, but hadn’t muslined, was Vogue 1479, an Isaac Mizrahi design with something like 9 pockets (patch, welt, inside, outside…). It seemed more complicated than I was up for as a first coat-making project. But I read all the directions, and was intrigued by the patch pockets — they have 2 separate openings, from the top and from the side. They also had a facing for the top, which the patch pockets on my pattern didn’t. The construction seemed straight-forward, and the top facing seemed like a good idea, so I swapped in the Vogue pockets. After a lot of head-scratching, I made the welt button holes before folding the facing and attaching the lining. I made 3 practice button holes before attacking the actual coat. Sadly the practice ones are very nice and the ones on the coat are pretty iffy. But they work, and I like the buttons I found. Bagging the lining. I read several blog posts about bagging (here and here), and in Linda Lee’s Craftsy class Underneath it All she shows how to bag a coat, with the opening at the hem. I decided to use Lee’s method — rather than the bagging opening in the sleeve. I found hand sewing the hem once the coat was right-side-out to be very awkward (Lee’s lining drafting directions has the lining fold over the hem for extra ease), so next time I make a coat I’ll try the opening in the sleeve method. Here’s the final coat. As I said, it’s not as warm as I hoped, but I’m really pleased with how it turned out. I’ve worn it every day since finishing it at on January 4th. The sleeves are too short — maybe because I added shoulder pads? 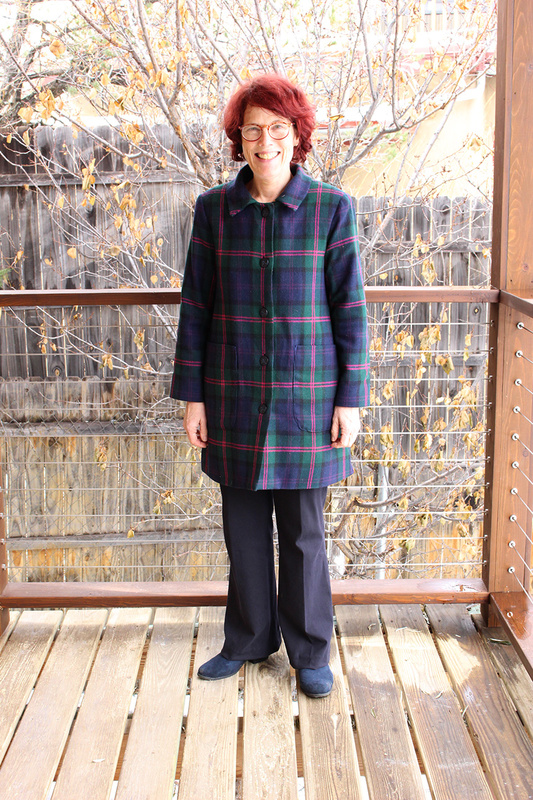 There’s something wonky happening at the hem where the coat closes… but YEAH, I finished! Since May I’ve been working on and off to find a fitted pants pattern that actually fits me. I think I’ve finally got the crotch curve and other adjustments figured out, and I wanted to see how my basic pattern could be applied to other patterns. 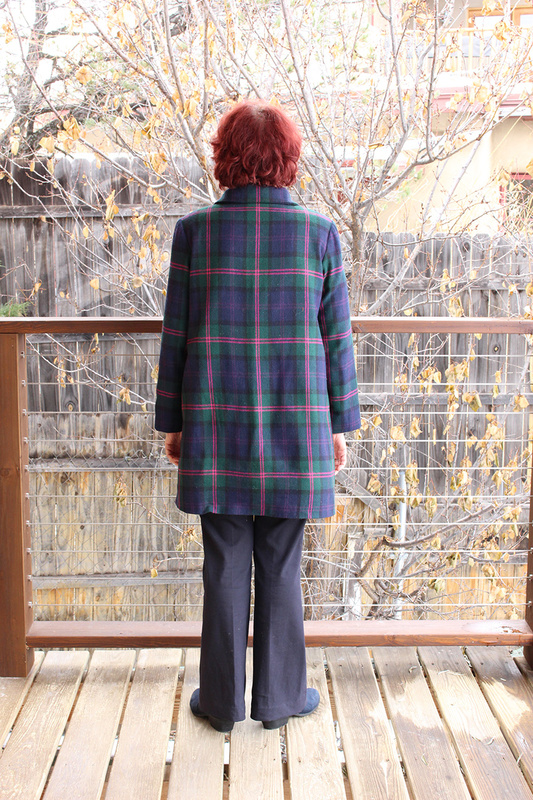 After seeing Manju and Lori’s version of Simplicity 8134, I bought it as my first test. The wide legs would cover up some of my fitting issues — heavy thighs and extended calves — and I could practice transferring my fitting block to the Simplicity pattern. When I looked at the reviews on Pattern Review, I saw these in a border print, so I decided to give that a try. 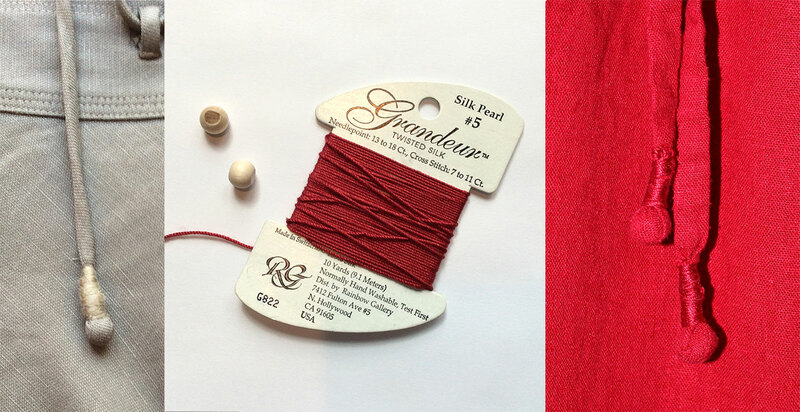 I found the perfect rayon challis from Sly Fox. Happily transferring my pattern to the Simplicity one was really straight-forward. I used the top of my pattern (from the crotch up) and the Simplicity pattern legs. 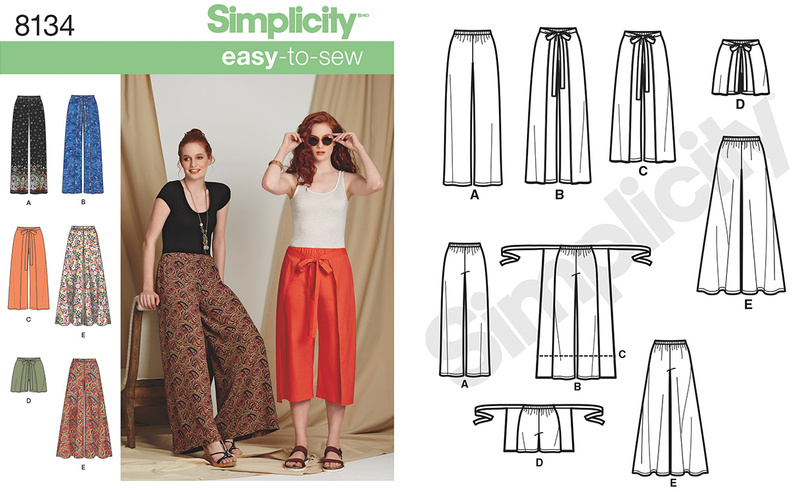 My pattern has a flat waist band with a zipper and the Simplicity one has an elastic waist. The wraps on these pants are sewn into the side seams, so I also had to modify the top of the wrap pattern. They were easy to sew up, the fit is really nice, and the fabric is soft and comfy. But as you can tell from the first picture in this post, I didn’t take into account that when I walk, the wrap flutters open and you see the wrong side of the fabric. I’m still debating whether that’s a big problem. I’ve worn the pants several times now, so maybe it really doesn’t bother me! Last month, Gillian, at Crafting a Rainbow, posted about fabric she liked, including ITY (Interlock Twist Yarn) knits. She said “ITY knit makes for fantastic dresses all year round.” I was looking for a fabric to make up Vogue 2017, a knit faux wrap dress (it’s a wrap bodice on top of a circle skirt), and since I thought I’d have to make a muslin first, I decided to give ITY a shot. And it’s all polyester, so I wasn’t sure how I’d like it. But after a bit of searching on-line, I discovered it comes in really wild colorful designs that seemed just right for this dress. 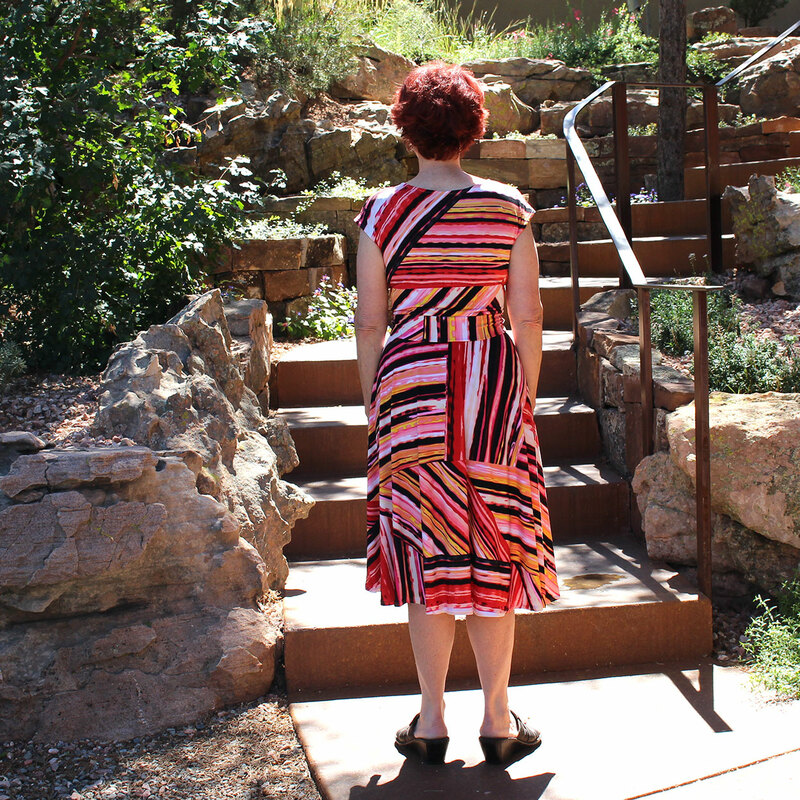 Making the dress was straight-forward, especially since the Pattern Review & blog posts mentioned some pitfalls. As drafted, the tie shows the wrong side of the fabric and the neckline is folded over to hem but the armscye has a facing. Several bloggers gave solutions for the tie (here’s one), and I cut a piece of fabric for the neckline and sewed it on like bias tape finish. 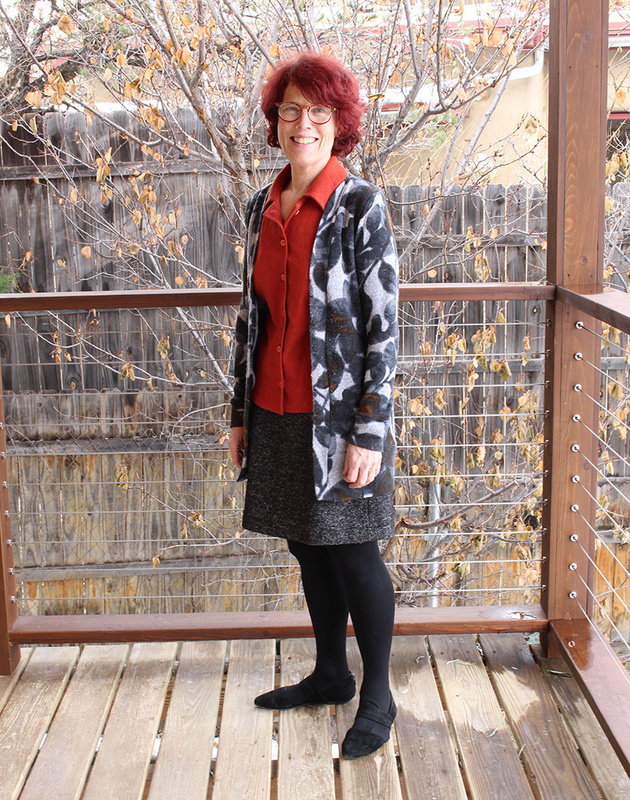 I also reinforced the neckline with fusible stay tape, which is what I’ve done on my Blackwood cardigans as well. (Don’t know if that was necessary, but seemed prudent.) I basted the bodice and tried it on before attaching the skirt and found the armscye pretty tight, so I removed a bit of fabric from the bottom of the armhole to fix that issue. My biggest problem was cutting the skirt — it’s 2 big pieces cut on the bias — and it didn’t fit on my cutting table, so I had to use the floor (awkward! and not back friendly). The other issue was marking the dots and such. My water solvable pen is purple and didn’t show up on the black, and my white chalk didn’t work very well either. So after a bit of Googling, I discovered “tailors tacks” — marking the dots by sewing a piece of thread through them. Lots of people mentioned the pattern ran really large, so I cut a 10 for the top and graded to 12 at the bottom. Usually I would cut a 12 top and grade to 14 at the hip. This is the first pattern I’ve made where I didn’t have gaping problems at the neckline (especially the back), so aside from the tight armscye, fitting was pretty easy. The ITY feels soft to the touch, the edges curl like my experience with cotton jersey. But the curling was only annoying for the little strips I made for the neckline facing. I used my walking foot on my regular machine for the top stitching and basting, and my serger to finished the seams. When I got everything together and put on the bodice with the skirt, I was surprised by how heavy it felt on my shoulders. But I wore it out to dinner over the weekend, and didn’t notice the weight. Actually the skirt feels pretty airy and float-y. I was surprised how much I like the finished dress. It’s sweater friendly (no sleeves to bunch up), so I’ll be able to wear it in the fall and spring as well as the summer. And I like the design on the fabric — I was really dubious about yellow, but it’s okay. I took 3 inches off the hem, but I think I’ll make it a bit longer next time around. I’m planning to make another one in a darker print. I didn’t notice the wrinkle in the back when I looked in the mirror before my husband took these pictures! 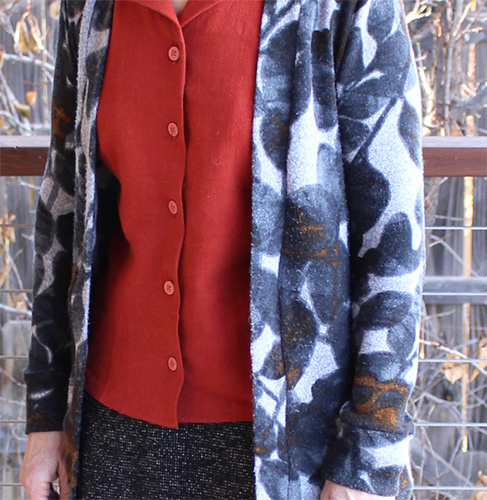 And if the pattern just feels like too much, it looks fine toned down with my Blackwood cardigan. 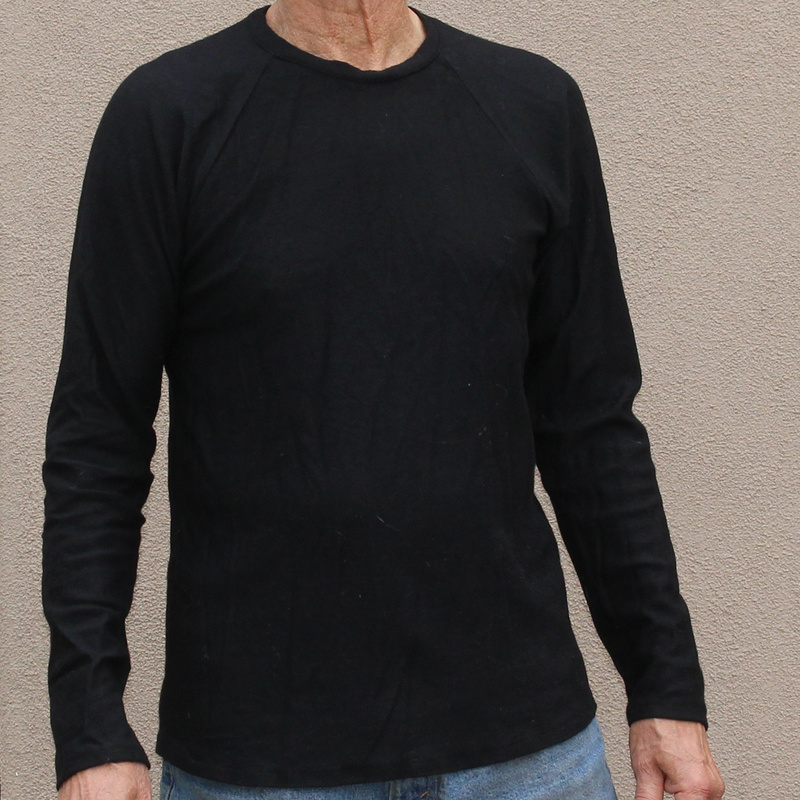 My husband has a much-loved merino under-layer he wears when he bikes in the winter. When I noticed Gorgeous Fabrics had some black merino jersey on sale, I snapped it up to make him a birthday present. 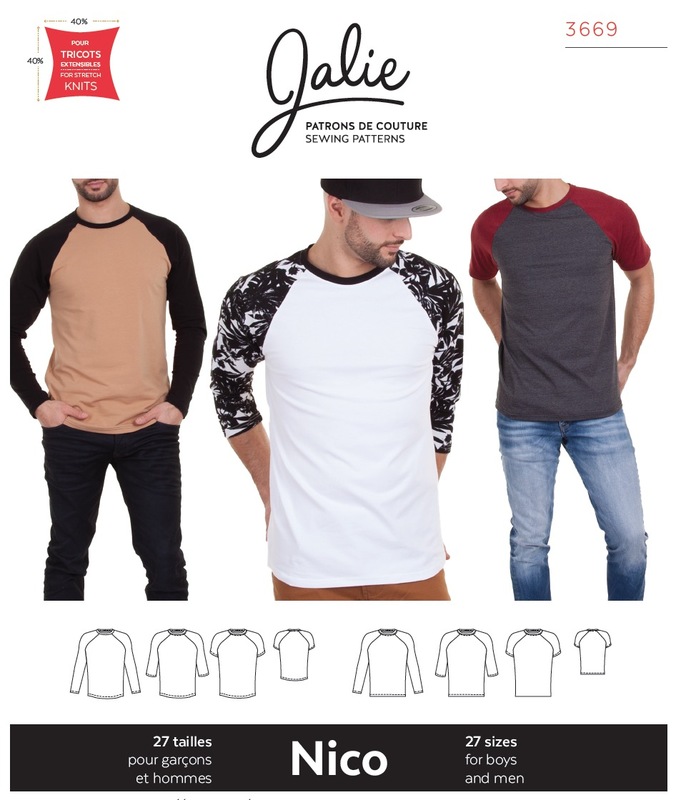 I thought a raglan top would be more interesting than a straight long-sleeve tee. Dawn, who blogs at Two On Two Off, has had a lot of luck with Jalie patterns, so I settled on Jalie’s Nico. After some measuring, I decided to make a size V, basically a men’s medium, which is what my husband wears in ready-to-wear shirts. Right off I made 1 alteration to the pattern — the seam allowance is 1/4″ and I have a lot of trouble with my walking foot on my Janome catching such a small seam allowance. So I increased it to 3/8″. 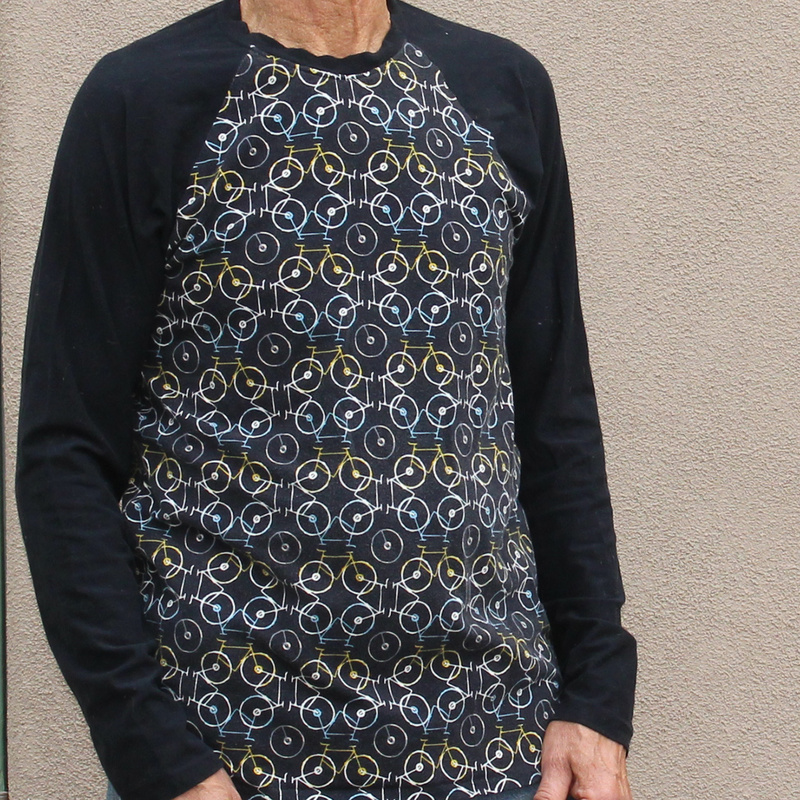 I had 2 left-overs in my stash — a black jersey and a bike print — so I used those to try out the pattern. 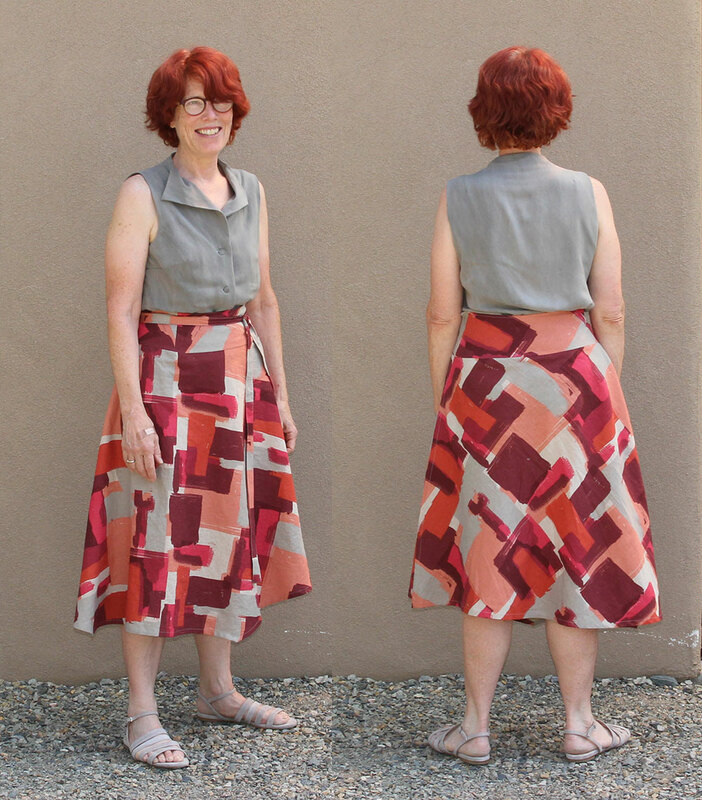 In her Craftsy class Sewing With Knits, Meg McElwee recommends stabilizing the neckline, back shoulder seams, and using fusible tricot tape on the hem before sewing it. I used these 3 tapes from Emma Seabooke: fusible tricot for the hem, woven stay tape for the shoulders, and knit stay tape for the neckline. The arms and torso fit fine. But the neckband was too big for the drafted neckline, and the neckline was too small for my husband’s head (a bit of tugging required to get it on). I made this one up during the winter, and despite the neckline issue, he wore it as lounge-wear in the evenings until it got too hot to wear sleeves. For my second attempt, I used the same Art Gallery black jersey for the sleeves as the first one and an Art Gallery grey jersey for the body (both from Hawthorne Threads). I took 1/8″ off the neckline and left the neckband the same. This was a much better fit about the neck. And the fabric is really soft and my husband has worn this one a lot. I also tried a twin needle on the hem for the first time. I was afraid I wouldn’t be able to get the needles threaded, but it wasn’t too hard when I used the head-mount magnifier that my husband bought me for just this problem! Now I was ready to make the merino version. It went together really quickly and I was excited to give it to my husband. Sadly, he finds the fabric really itchy, and by the time I had it finished, it was too warm to wear. So I’ll have to wait until winter to see if the itch goes away or he’ll have to wear a tee underneath. But the pattern is a winner, and I’ve got plans to make a few more. 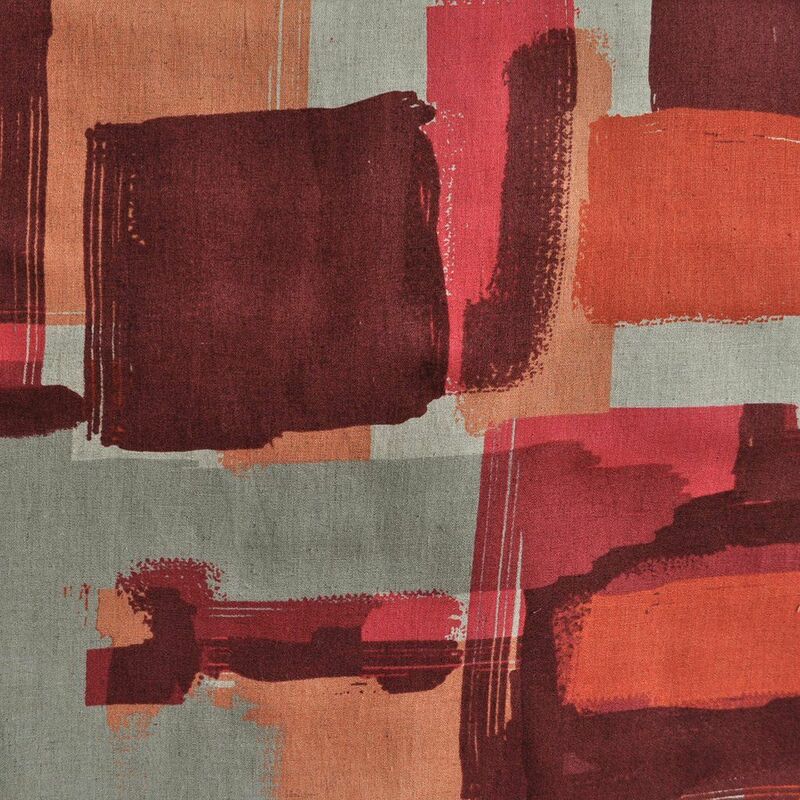 I bought some Robert Kaufman Brussels Washer Linen in Brick Red from the Confident Stitch to make a wrap skirt and to compare the linen to what I’d gotten online at the Fabric Store and locally at Joann. But then I saw an Instagram post by @paperbagwaist. She posts RTW garments and suggestions for patterns so you could make them. 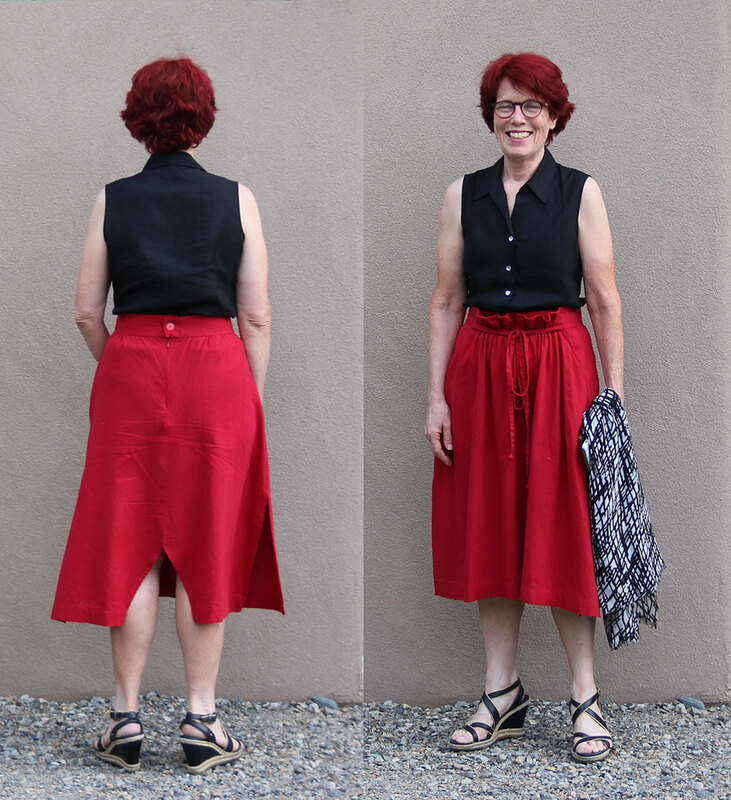 Once I saw this RTW skirt, I knew that’s what my red fabric was destined to be. I’ve never made a Burda pattern. And it wasn’t quite the inspiration skirt. So I hemmed and hawed for a while about which one to make. The DIY pattern would be easier but the Burda pattern waist band seemed a better fit for someone hippy like me. Finally I decided to buy the pattern and see how hard it might be. The instructions are brief and on first reading kind of made sense. I printed and taped the pattern, and the instructions made more sense. But I was unsure about whether some of the pieces needed seam allowances. PDF pattern to the rescue! I remembered that the first page of the pattern had a miniature image of the taped paper layout. I could use that to make a doll-sized mock-up of the skirt and figure out how it is constructed, answer my questions about seam allowance, and figure out a strategy for finishing the edges. I read the page into Photoshop and up-sized it to fit on a piece of 8-1/2×11 paper, added a 1/8″ seam allowance where I thought they were needed, and then made my doll sized skirt out of some fabric leftovers. That was fun! And quite informative, since I had misunderstood what size to cut the waist-band and, yes, the pockets do need to have a seam allowance on one side. I also figured out how to fit the skirt, which included moving the zipper from the side to the back and cutting the back in 2 pieces rather than one. I ended up taking an inch off the center back seam and gathering the back more than the pattern called for. The planning and fitting were time consuming, but after several long weekends, I had a skirt! One last detail. I made the draw string much longer than the pattern called for, so I could tie it in front like my inspirational skirt. 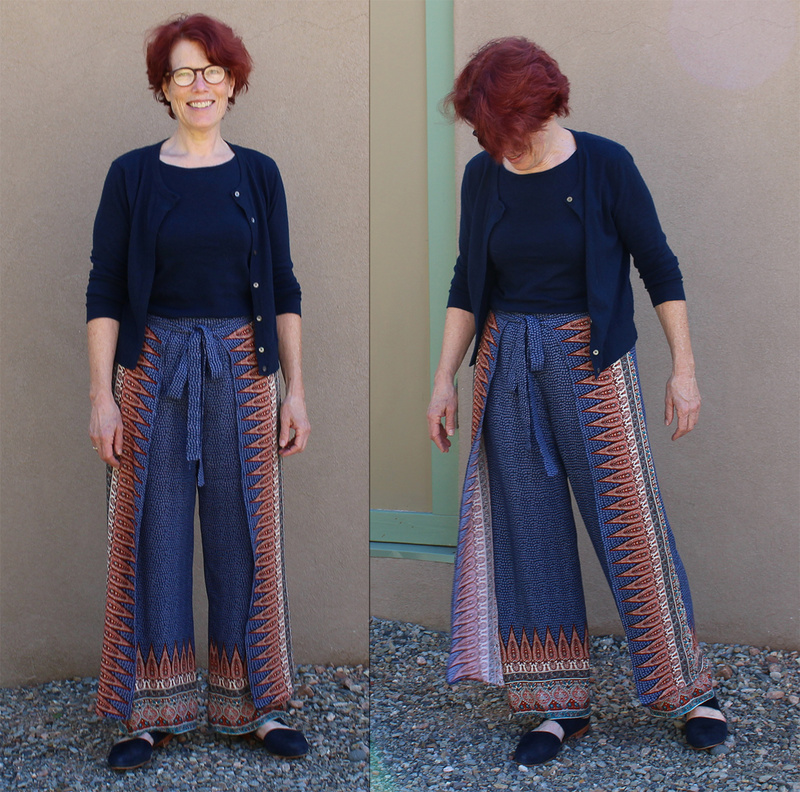 I have a RTW wrap skirt with a clever method for finishing off the ends of the drawstring. Below left is my RTW skirt. In the middle, from my crafting stash, I found several round wooden beads and some needlepoint thread that exactly matched my skirt color! I pushed a bead into the end of the drawstring about an inch, then folded the excess fabric over, wound my silk thread tightly upwards from the bead until I’d covered the folded fabric, and tied a knot. The result is on the right. Worn with a RTW linen top. 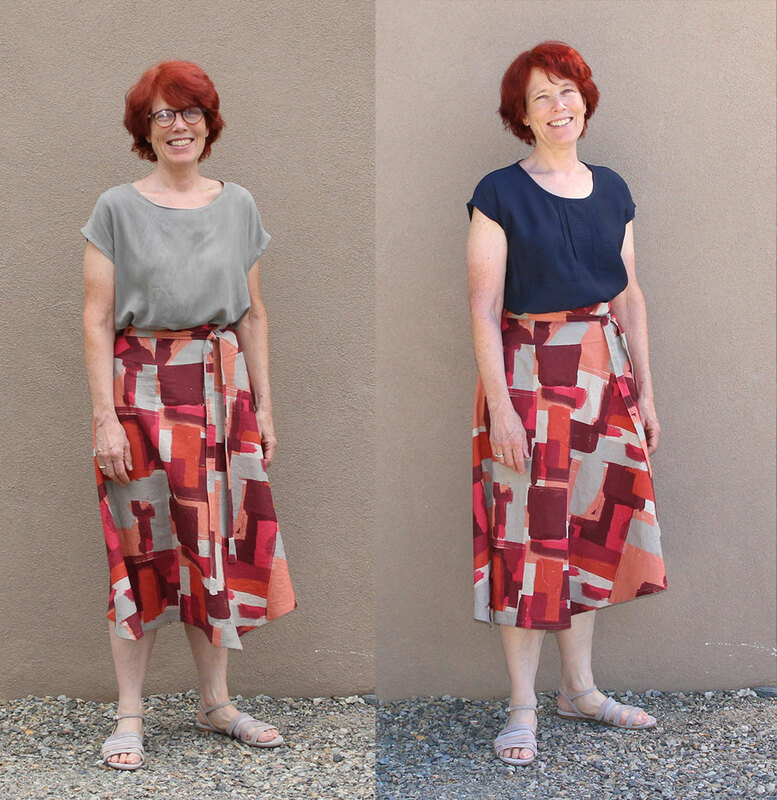 During #MeMadeMay, Rebecca posted a lovely wrap skirt she’d made from a Japanese sewing book called Shape Shape 2. 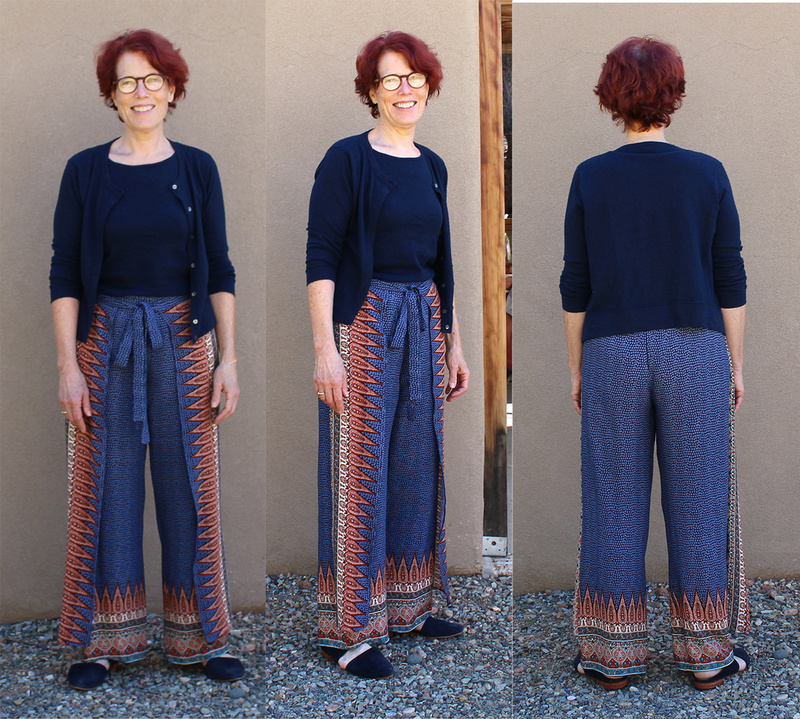 And Masha (@maze.handmade) posted a skirt that turns into harem pants from the same book. 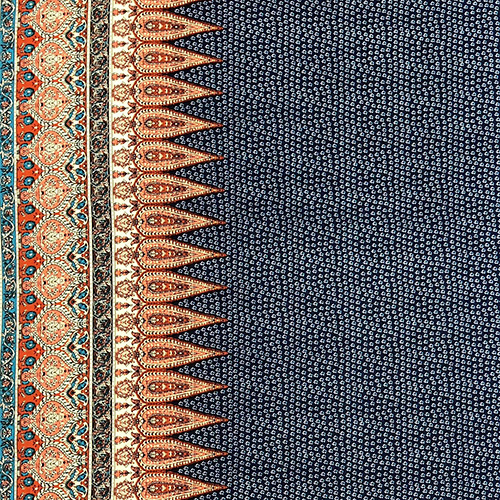 Inspired, I bought a copy of the book and, for the wrap skirt, this Japanese linen blend from Style Maker Fabric. When the fabric and book arrived, I was quite excited. The idea of a “seamless” skirt where I didn’t have to ponder over how to finish the insides was quite appealing. 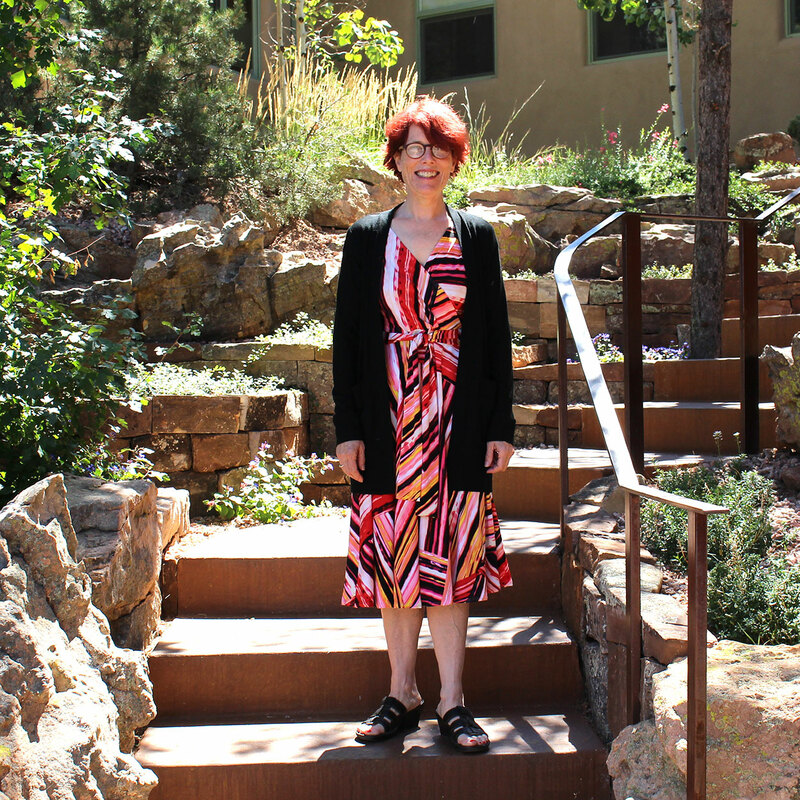 Until I realized that my vision was a midi-length skirt and the pattern was for a knee-length one. 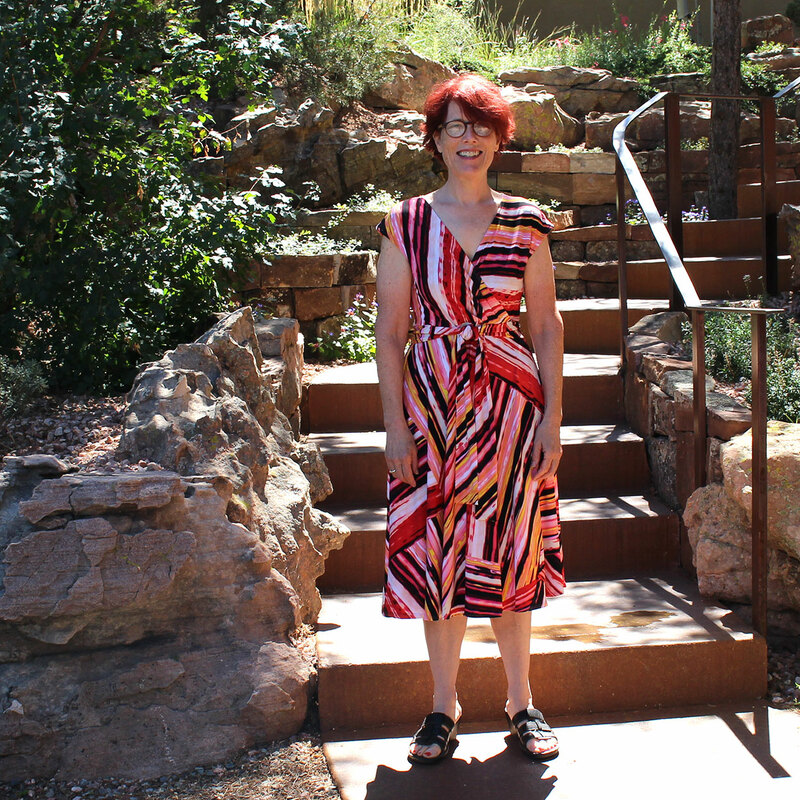 And the fabric was the narrow 44″ variety and I didn’t have enough to lengthen the skirt at all. After some head scratching, I realized I could go up rather than down, by adding a waist band to the top of the skirt. I made the widest band I could fit on the fabric after I’d cut out the skirt. I used some twill left over from another project to line the band, thinking that it needed some structure. I’m not sure this was the best idea, as the twill is a lot heavier than the skirt fabric and didn’t behave very well when I tried to hand-sew it down to the bottom of the waistband. So the skirt insides aren’t very pretty. Maybe I should have interfaced the band and used a lighter fabric for the lining? But I’m really pleased with the result and have worn it a bunch since finishing it. Especially since I have several tops that work with the fabric pattern, so I can dress it up or down. And maybe best of all — I used up all the fabric, so I don’t have to think about what to do with the leftovers! 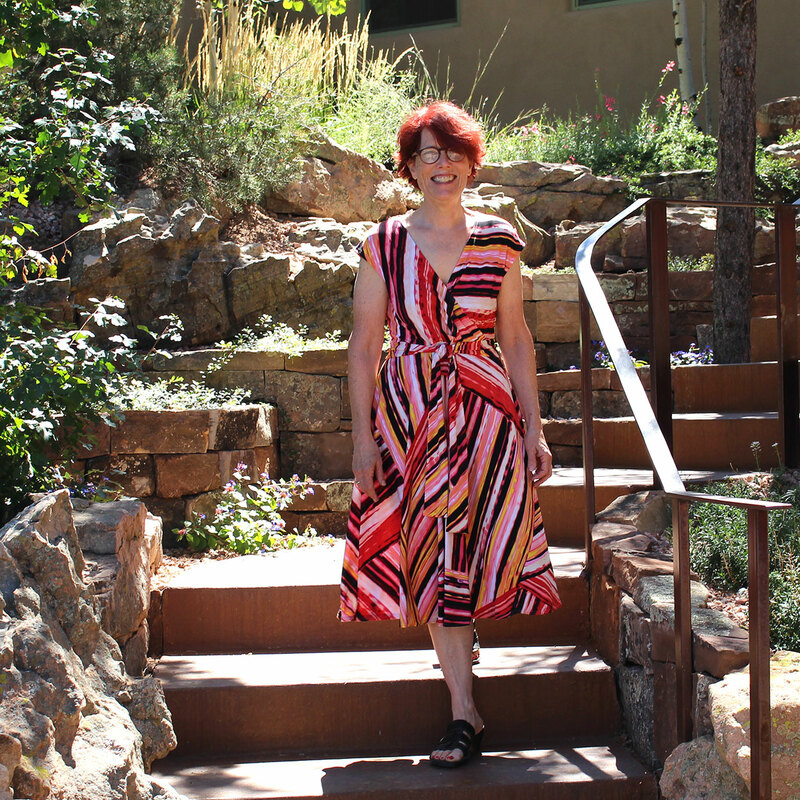 The top is McCall’s 6750 from this Craftsy class on tissue-fitting tops. On the left is a Maya top in the same sandwashed rayon as the shirt above, and on the right is a RTW blouse. In April, I made the Grainline Scout Tee, above left, in Mammoth Flannel in Pumpkin/Grey that I bought from Style Maker Fabric. I used the neckline variation tutorial from the Grainline blog (in 2 parts: here and here) and the added long sleeves with this tutorial. The neckline mod was quite straight-forward, although I made my V shorter than Jen did in the tutorial (by an inch), as it looked like the V showed off a bit more than I wanted. The sleeve tutorial was more confusing, and I was very unsure if I had to move the grainline or where to move it to on the new sleeve piece. I left it where it was and it all turned out okay, but if I make another long sleeve Scout, I’ll probably buy the recently released Scout sleeve variation pack. 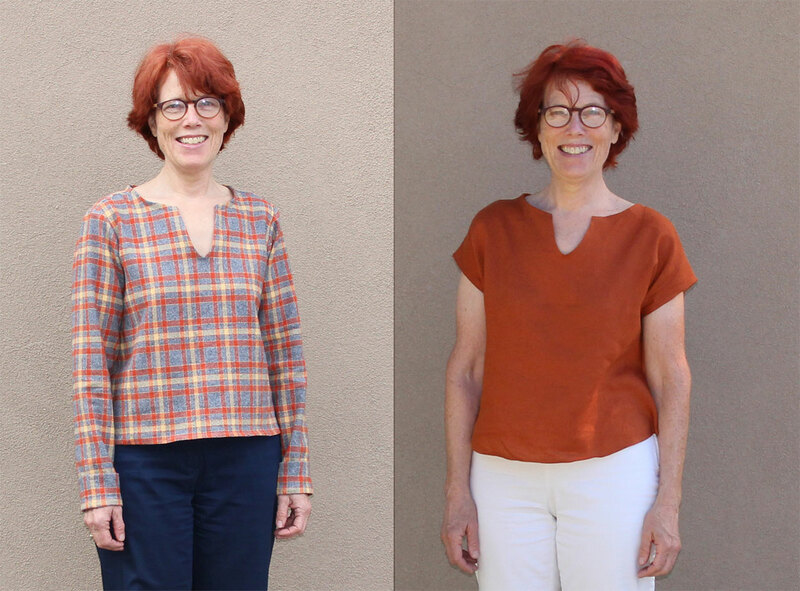 I’ve been on a tear making Maya tops for my summer wardrobe, and I really like the Scout neckline variation, so last week I made a Maya with one (above right), from a lovely paprika colored linen from The Fabric Store. 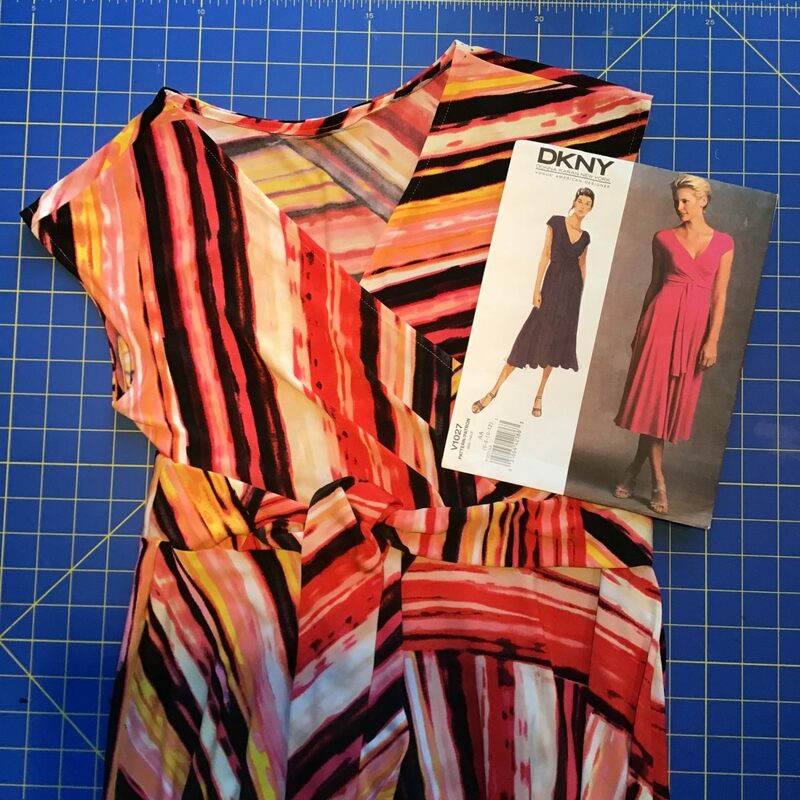 I used a bias binding for the neckline, so for both the front and the back pattern pieces, I lowered the Maya neckline 3/8″ to change the seam allowance to 1/4″. 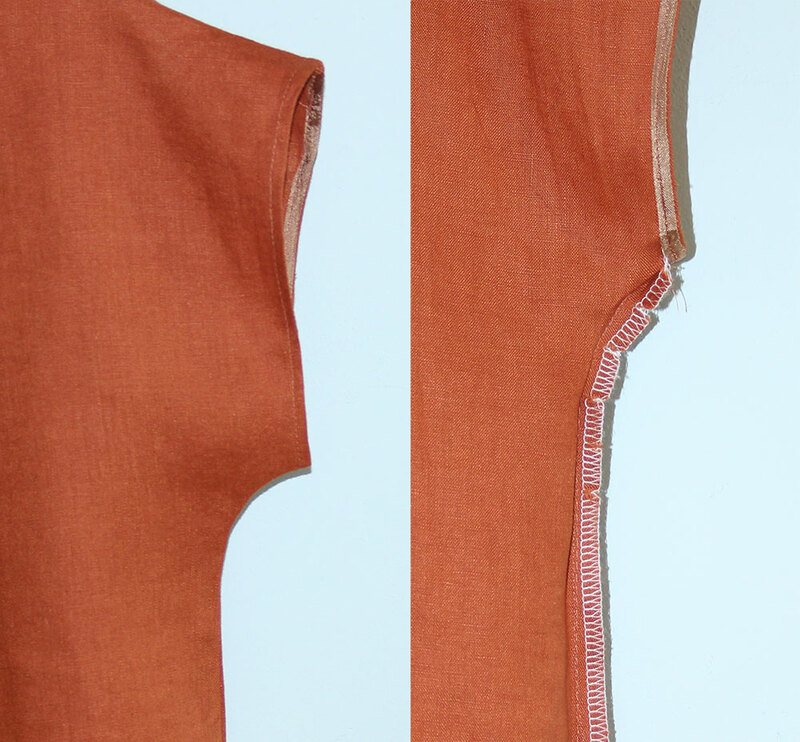 Sew the shoulder seams and finish the edges. Sew the side seams on my sewing machine, clip the curve, then use my serger to finish the fabric edge. This is the method Kylie shows here. Before I got my serger, I sewed the side seams on my machine, clipped the curve, and sewed a second line of straight stitches about 1/4″ from the seam line, catching the clips a bit, for reinforcement. Here’s the sleeve curve from the outside and inside.